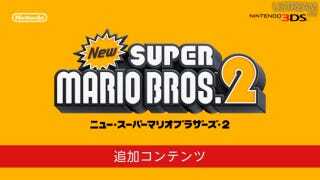 In their October 25th Nintendo Direct stream, Nintendo has announced the release of 2 new packs for New Super Mario Bros 2. The first is the Gold Mushroom Harvesting Pack (Difficulty 2 out of 5), the second is the Record Challenge B Pack (Difficulty 3 out of 5). Both packs will be available after the Nintendo Direct stream concludes at 8:00 AM EST.